Getting ready for Eid prayers.. 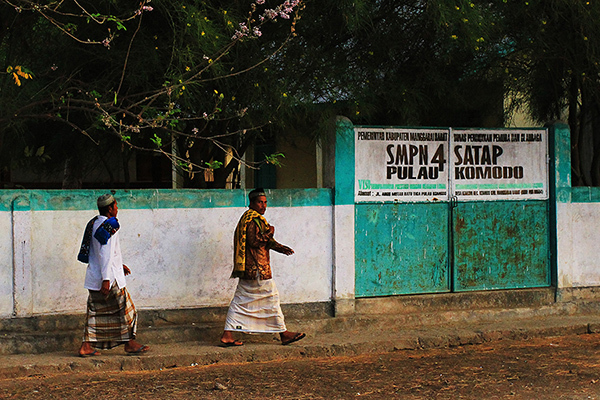 The third day of our Komodo diving trip just coincided with the feast of Eid al-Adha. So, when we did the cruise plan along with Captain Meko a.k.a. Pak Makarudin, the ship captain, and Wilson, our dive guide, we set it up that on the second night MV Tarata will be anchored off the coast of Komodo village located on the east coast of the Komodo island so in the next morning my fellow Moslem friends onboard and I can go down to the village for the Eid prayers. So, after spending time enjoying the sunset view at Pink Beach, we all immediately returned to the ship, got freshened up and had dinner. And MV Tarata slowly began to move west, toward the east coast of the Komodo island..